I decided that I wanted a stainless steel shower in our new house. I’d installed enough tile and fiberglass showers over the years to turn me off both applications forever. Stainless steel would be long-lasting, worry-free if you don’t mind water spots, and cool/different. The house has a few industrial touches in it and this seemed like a fit. 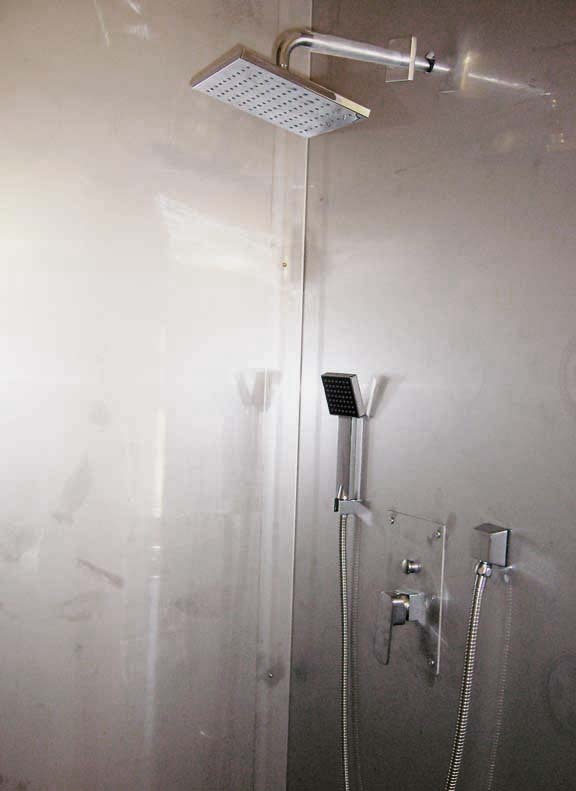 As it turned out, we don’t see many stainless steel showers in the U.S. other than in jails and vintage travel trailers. The price for a standard size stainless steel stall made in the U.S. is about $8,000. Choke. Meanwhile the option for anything standard was out since I made the space extra wide and tall and the drain slightly off-center for reasons I won’t go into here. The price would be even higher! So I drew up a plan and took it to a local metal fabricator: Mid Valley Metals in Eugene, Oregon. After all, it’s just three walls and a base, and metal isn’t that expensive. They would manufacture the walls and base from 16-gauge stainless steel with a mill (factory) finish. The wall tops would extend to the 9-foot ceiling and the base edge would be flush with the tile floor. Trim for the top and sides would also be provided. Mid Valley would plasma cut holes for the fixtures and suggested they also cut holes for the screws so that I wouldn’t be wearing out drill bits on that hard stainless steel. The extra cost was nominal and saved me a lot of time and frustration. As it turned out, the price would be $1,600. That was less expensive than a good quality fiberglass unit, plus it would be my custom-sized stainless steel shower! They sent out a guy to verify the measurements, which agreed with mine but it didn’t hurt to double-check. I indicated where the fixtures would be and ordered an extra face plate for the shower handle, as the one it came with was cheesy looking. To note, we found the fixtures on Amazon and eBay from reputable sellers who charged about 1/3 of retail. Fixtures, including light and plumbing, seem to be some of the most overpriced items you’ll contend with for a house project. I encourage you to shop around, even look for used stuff. It can take patience, but if you have a tight budget and the extra time (or a spousal unit who loves bargains), you can save a lot of money. While Mid Valley Metals built the parts, I did the prep work. My shower space is 42 x 36 inches, the insulated walls are 2×6 framing with a vapor barrier and 1/2 inch sheetrock. The floor is concrete slab. I installed a layer of 1/2 inch thick cement board and a 1/4 inch thick fiber cement board. Both were preventative measures in case water gets behind the sheet metal, which is unlikely, plus they provided a firm base for the wall panels to bond to. 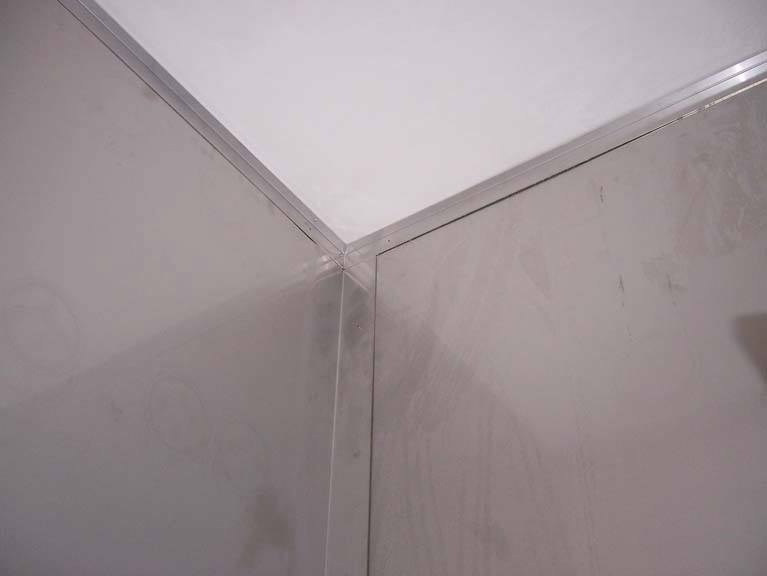 The building code requires a 1/4 inch-per-foot drop for a shower base, which was accomplished in the manufacturing process by creasing the metal in the base from corners to drain. My walls weren’t perfectly plumb, so the metal would not lay as flat as it should. I made a fairly elaborate shimming system using felt paper, 30 and 15 pound, that was bonded using a super flexible sealant. By the time I was done, the walls were plumb in the corners and for the most part had a flat surface on all three sides for the metal to rest on. I used leveler to bring up the floor a bit and make sure it was level. Then I used more shims to account for the drop. Now it was time to put it all together. The base went in first. I had Mid Valley Metals make 4 inch walls for the surround edges. That’s more than needed, since the step out of the shower is just 1 inch, but it’s what I did. Note the drain is dimpled. This was because the only shower drains I could find, locally and online, were for tile application. They set up higher than necessary for sheet metal. The dimple made it so the drain would set down low enough not to puddle. My neighbor helped install the back and walls. First I applied the glue, then we fit the metal into place. I bought some heavy duty locking suction cups that worked great for the chore. But beware, they can fail sometimes, so don’t have a foot under the metal while depending on them to hold it up! We installed the back wall first (which was the heaviest) and used pressure sticks to hold it in place, allowing the glue to dry overnight. Then we installed the two walls and applied pressure sticks between them, as shown. The sticks had foam on each end to keep from scratching the metal and to create a snug fit. Finally, I put in the screws and trim pieces, then installed the fixtures. 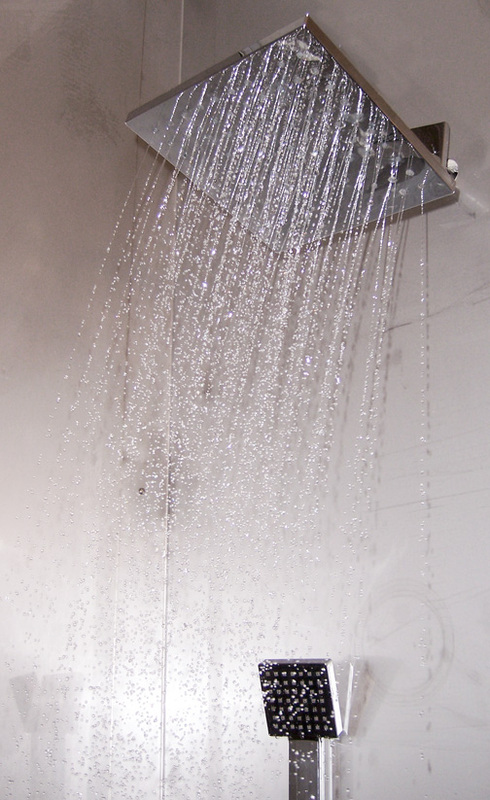 I hope this article will assist you in building your own stainless steel shower. I didn’t find much information out there so this was pretty much done on the fly. I’m pleased with the results and all the money we saved!